This is my 17th Easter Sermon, and I still find it tricky. We come to this moment each year with a crescendo of hope and excitement, but also with a great theological burden. What happened? Was the tomb of Jesus really empty? Was the resurrection a physical resuscitation of the body, or an apparition seen by his followers, perhaps even completely made up mythology? If we were there at the resurrection moment, would it have been a video recordable event? Stone rolls away, Jesus suddenly blinks, reaches for his Iphone and captures the moment with a selfie? Jesus, the man of Nazereth, died on a cross like thousands of dissidents in the Roman Empire. Executions throughout history are part moral lesson and part entertainment. Jesus execution is complete with gambling, taunting, a little vaudeville to see if he will call down helping angels. I wonder if a few jugglers and fire breathers were at the edges of the crowd. After a full weekend, Passover pilgrims went home with stories to tell and life returned to normal. For the majority of people in Jerusalem and Palestine, Jesus made no lasting impact on their lives. None saw this as a defining moment in history, just one more small victory for Rome. It might have made the top 10 stories for the year 33 AD if Time Magazine had been around, but who would have said that this was the defining moment in history. Wolf Blitzer might have been able to pump up the search for the body of Jesus for a couple of weeks, but they would have been much more fascinated with the story of whether Jesus was married or not. With all the Easter resurrection build-up as the defining event of Christianity, the writers of the four gospels didn’t leave us a unified story. Mark’s Gospel says the disciples came to the tomb, found the stone already rolled away, all the action is off camera, and they hear the news that Jesus is raised from the dead, and they run away in fear and tell no one. Another great moment in the history of the disciples, right? In Matthew’s Gospel, the two Mary’s are walking to the tomb when there is an earthquake, and angel rolls away the stone, Jesus emerges with an appearance like lightning, the Roman guards tremble and an angel announces the news to the two women. In our reading in John today, which is written a generation after Matthew, everyone runs to the tomb, they look all around see the rolled up grave clothes, but they can’t comprehend what is happening, so in verse 10 it says, “The disciples returned to their homes.” They went home? Was there a Red Sox game on? Wasn’t home in Galilee? Weren’t the Gospel writers aware that 20 centuries later preachers like me would have to make sense of all this? It fascinates me that even though Matthew and Luke clearly read Mark’s account, and yet they chose to write three different versions of the resurrection story, and then John comes along and writes a fourth account a generation later. Clearly a unified story that tangibly proves the resurrection was not important to them. If that was the point, they had every opportunity to do so. So many of our questions are related to our experience of time place and history. Our questions have to do with physics, scientific burdens of proof, scholarly and journalistic standards, that did not exist for the Gospel writers. They were trying to tell a story to awaken faith and hope. Before we are too hard on the Gospel writers, let’s admit that our modern histories leave much to be desired. Have we ever gotten to the bottom of the assassination of JFK? There was a defining moment in history, where we even have the famous Zapruder footage of the shots that killed him. For the next generation of Baby Boomers, the assassination of JFK and later MLK and RFK were defining. People remember where they were when the heard the news that JFK was assassinated. Schools closed and children went home, the gas stations stopped pumping, the office buildings emptied out, churches opened for prayer and people turned on their black and white TVs and tried to make sense of the assassination. In the decade to follow, boys grew their hair long and some fled to Canada while others kept flat-tops and went to Vietnam. Hippies went to the country side, the Jesus Movement formed communes, protests accelerated on college campuses, and groups ranging from the Black Panthers, Feminists, civil rights groups and the sexual revolution and drug experimentation all convulsed at once. We are still fighting the so-called culture wars launched by these events. The great artists of the 1960s tell a convoluted story as well. Who tells the story best for this decade – Stanley Kubrick’s movie JFK, Martin Luther King’s “I Have a Dream” Speech, Timothy Leary’s experiments, The Beatles White Album (“Say You Want a Revolution”) or Betty Friedan and the Feminist Mystique, also written in that fateful year of 1963. What is the meaning of the 60s? It is rich and complicated, and depends on where you look. So don’t be too hard on Matthew, Mark, Luke and John for a few perceived inconsistencies in their great narratives. He holds a small cross in his left hand and stands on the bi-fold gates of Sheol, Hades, or Hell which are shattered into a cross-shaped structure beneath his feet. Jesus is bending forward — gently, tenderly, graciously — and, stretching out his right hand, he grasps and pulls on the rather limp wrist of Adam. Beside Adam stands Eve. Behind the two of them stand a youthful Abel, with shepherd’s staff, and an older John the Baptist, with beard and long hair. They are the first martyr of the Christianity’s Old Testament and the first martyr of its New Testament. At the top of that diamond-shaped image, lest there be any mistake about meaning, is the word Anastasis, Greek for “resurrection”. 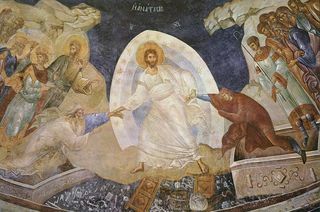 But is not Easter about the absolutely unique resurrection of Jesus alone, so why are any others involved and, if others, why precisely these others? The answer reveals a major difference between Easter Sunday as imagined and celebrated in Eastern Christianity as opposed to Western Christianity. It also reveals for me the latter’s greatest theological loss from that fatal split in the middle of the eleventh century….The great exception is how Eastern Christianity portrays the “Resurrection,” that is, in Greek, the “Anastasis,” of Jesus. Across vast stretches of time, place, art, and tradition, icons and illustrations, frescoes and mosaics show always a communal and not an individual resurrection for Jesus. As with any great event of history, there is what happened and then there is how it defines us as we seek to understand. What if Easter is about more than us, as individuals getting to heaven as a reward for a good life? If the resurrection is communal, new meanings emerge. The Anastasis icon is not mere history, it is proclamation. It proclaims that violence and death is not what defines us, that John the Baptist who was beheaded for his politics, and Abel who was killed in a jealous brotherly fit, are defined by a God who loves them, not by the misfortunes of how they were killed. If Adam and Eve are there, those tragic first humans who supposedly spoiled paradise with the first disobedience to God, then we are all there. Then we are all defined not by our mistakes and inadequacies, but by the grace of God who renews and transforms us. Christ is risen as we join hands across time with unlikely fishermen, and grieving women at the tomb, with those who were torn apart by lions in the arena for their faith, with the gentle Francis of Assisi and the bold Joan of Arc, with Desmond Tutu, Teresa of Avila, Mother Teresa, and Martin Luther King, Jr. The resurrection is the great joining of hands of those who love, those who do justice, those who participate in the Beloved Community. If you want to understand the meaning of the resurrection, then join hands right now with your neighbor, stand and join hands across the rows of the sanctuary…if you want to know the meaning of the resurrection, and how Christ is raised from the dead, hear it is…listen believers, questioners and questioning believers…Christ is risen as we join hands and obey his commands, that we love one another, that we love our neighbor as ourselves, that we seek even to love our enemies. So raise your hands together with me and lets say it together…He is Risen! Christ is Risen! Alleluia! Alleluia! Amen.